Notice the distinct fingernails on the Florida Manatee’s flipper and how they look very similar to the elephant’s toenails. Also the manatee’s small eyes closely resemble the elephant’s eyes. 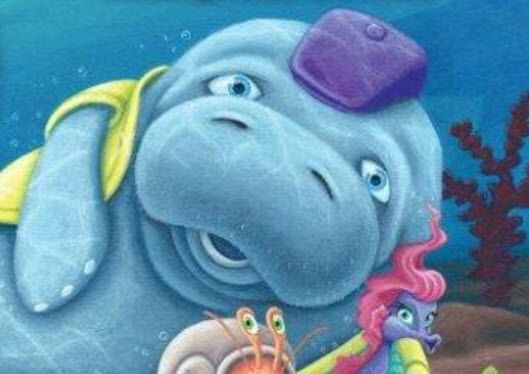 Is the manatee related to the elephant? 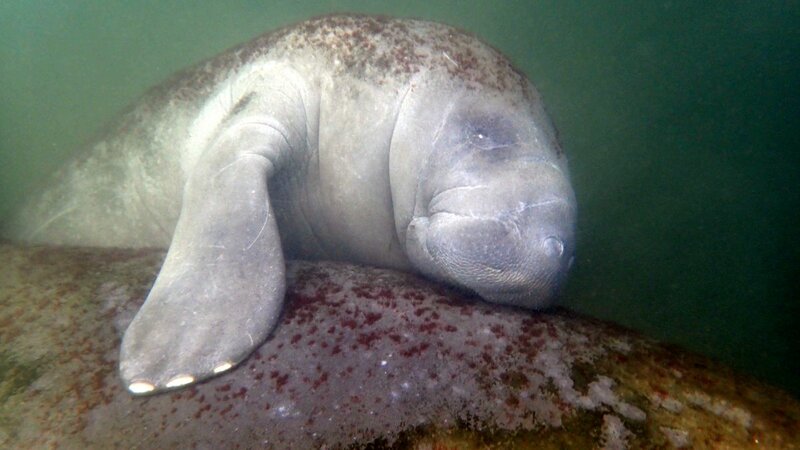 The Florida manatee (yours truly – Kobee Manatee) is actually a sub-species of the West Indian Manatee. The other sub-species would be the Antillean manatee, which is found in the Caribbean over to eastern Mexico, eastern Central America, northeastern South America, and the Greater Antilles. The Florida manatee is very large! The adult is normally 9 to 10 feet in length and weighs an average of 1,000 pounds. However, there are some occasions where the adult can grow to over 13 feet long and weigh more than 3,500 pounds. The manatee is also an herbivore, meaning it eats only seagrass and aquatic plants. The manatee has two flippers, which it uses for steering and also for holding vegetation while eating. Its body is very large and tapers down to a paddle-shaped tail, which the manatee uses for swimming. In general, the manatee moves around five miles per hour. However, it can swim as fast as twenty miles per hour for short distances. Additionally, the Florida manatee has rather wrinkled, grey leathery looking thick skin, which continuously flakes off. This is actually a good thing because algae can grow on the back and the tail of the manatee, which makes its skin appear green or brown. As its skin flakes off, so does the algae. …What very large land animal roaming around in Africa today has these same characteristics? If you said, “The Elephant,” you would be correct! The elephant and the manatee are closely related to each other. About 50 million years ago, the elephant and the manatee actually shared a common ancestor. And through the process of evolution, the animals that enjoyed land became elephants and the animals that preferred to hang out in the water became manatees. More evidence of their closely related ancestry is that both manatees (herbivores) and elephants (herbivores) have molars, which help them grind up the plants they eat! Cool and Interesting Facts about Florida Manatees (Part 8)… Are the Manatee and the Elephant Related?